One thing above all makes a successful startup: people who purchase and love the product. If you have that, it means you’ve managed to offer the market exactly what it needs or, in other words, achieved a product/market fit (PMF). But how come it’s so challenging to reach success as a startup? What are the steps you need to take to identify your product/market fit? How do you measure results and see if you’re doing everything right? In this guide, we’ll answer these questions and give you a step-by-step guide on how to achieve, measure and test product/market fit. A 1990s study by Dun & Bradstreet showed that “inadequate sales” are one of the most frequent performance factors causing business failures. The problem is still relevant today, and it relates directly to the ability of a business to achieve product/market fit: the “inadequate sales” are a result of the business not delivering a product the market demands. So, it follows that product/market fit is the degree to which a product satisfies the needs of the market. In terms of the business lifecycle, PMF is a solid point from which a startup can enter the fast-paced growth phase, because the company offers exactly what people want and need. What if a business doesn’t achieve product/market fit? According to Paul Graham, a computer scientist and entrepreneur, the most common mistake startups make is trying to solve problems that no one has. If a company is striving to solve unexisting problems or offering poor products not suitable for the market, it, eventually, fails. Difficulty in getting the word out and attracting media attention, and so on. In contrast, when the product/market fit is achieved, products disappear from the shelves as soon as they are launched. Reporters can’t wait to write about the company in the media. And there are lots of repeated purchases, a big community of brand ambassadors, and a constant need to enlarge the team to cope with the high demand. If all that sounds tempting to you, let’s move on from theory to practice and see what steps you can take right now. It takes a lot of patience, time and effort to find a product/market fit, but the results are more than worth it. You’ll end up with a successful product and be ready to win over the market and the hearts of consumers. The key here is to stay persistent and true to your goals. At the same time, you should understand the needs and problems of your audience to ensure you invest in something that’s applicable in real life and has a future. Here’s a step-by-step plan for you to follow. Use it as a product/market fit checklist while you develop and introduce your new product. It all begins with a target audience, as these people determine what products will be successful. Distinguish your audience by answering the question: “Who will most benefit from this product?” Describe these people or companies in detail: who they are, what they do, the challenges they face, what they are trying to achieve, their values, and so on. Outline your high-expectation customer (HXC) by studying the market. An HXC is an ideal consumer who will value and enjoy your product and all its features the most and also will be able to fairly evaluate it. This person is full of insights, knows the market and is always ready to share great ideas. The reason why you should identify the HXC is simply that if you manage to prove product/market fit to them, your product will also impress other users. Divide this audience into segments with similar problems, behavior patterns, and demographics, and then create buying persone which make it clear for everyone involved in creating the product who your customer actually is. Explore your buying personae, their habits, and lifestyles to establish the needs, pain points, and desires, hidden or obvious. This will help you identify what problems your product should be solving. If there’s a demand, there’s always competition. To outrun your competitors, you need to figure out your proposition value – that is, the thing that makes your product different from the others. Your value proposition is what you promise to consumers, and it should represent value and solve real-life problems. New products and companies require a strong value proposition to succeed. If you offer a B2B2C product or plan to approach several target audiences, the task is even more complex. You’ll need to shape a value proposition to each of the audiences, as they have different needs and pain points. Mark out the features your product should necessarily have or without which it wouldn’t exist. In other words, define a minimum viable product (MVP) feature set. Don’t overwhelm the MVP with extra features, as it doesn’t have to be perfect; it just has to work. The MVP is oriented to the early users; later, their feedback will, help you improve and polish your product. Based on the features you’ve defined, create a prototype of the product. For that, you can use tools like Sketch, Figma, Adobe XD, UXPin or InVision Studio. A prototype is a visualization and interactive demonstration of what the end product will look like and how it will operate. Further, it can be used to pitch your ideas to investors and stakeholders, so put serious effort in it. Next, it’s time to demonstrate the prototype to people who represent your target audience, hold a product/market fit survey and ask for feedback. Gather the comments, make any necessary changes, and test the updated version. Repeat this cycle until you know your product fits the needs of your targeted consumer. After a series of tests, the prototype should become an MVP product ready for use. A developed product should go through another round of tests to adjust the demanded features and get ready for the official launch. For the alpha test, you should not only gather feedback online, but get out there and talk to your audience. Hold customer interviews and apply that information to upgrade the product. After the development of the MVP and a series of tests, it’s time to launch your product in front of a big crowd. Incorporate all the data you’ve gathered during prototyping, MVP development and launch, and testing. During the development process, always keep in mind that the end product should fulfill basic consumer needs and provide essential features. But this is just the beginning. After the launch, you will again receive feedback and comments from users, which you should apply to keep improving the product. Measuring the results begins with clear goals, which you set at the prototyping stage. To find out if you’ve reached your desired results, define key metrics for product/market fit that you are going to track. The “40% rule” is one of the strongest indicators of product/market fit. It was coined by Sean Ellis, who worked on the growth of Dropbox, LogMeIn, and Eventbrite. To apply this technique, companies ask existing customers how would they feel if a product they use suddenly disappeared. Over time, Ellis had benchmarked at least a hundred different startups. 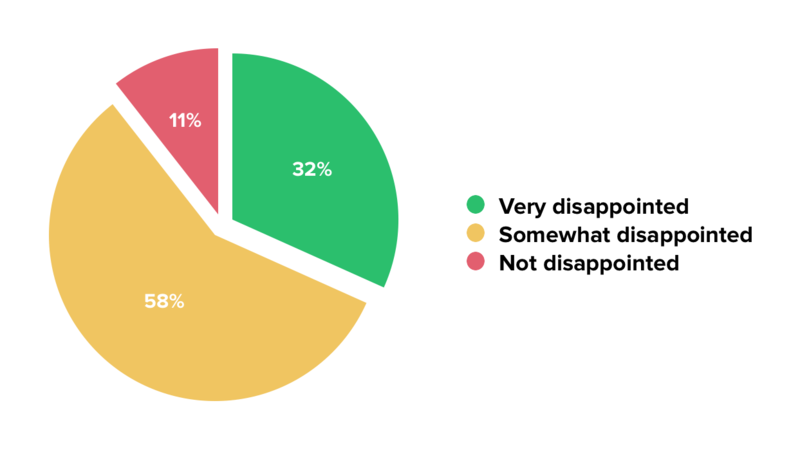 As a result, he figured out that if 40% or more of a product’s users would be very disappointed if the product disappeared, the company would grow faster compared to others that struggled to succeed with a “disappointment rate” of less than 40%. How to track it: Create a survey in SurveyMonkey or similar tool, and send it out to your existing customers. After you get the answers, see where they stand in relation to the 40% result. The bounce rate refers to the number of single-page website visits. High bounce rates may be an indicator that your website is not making a positive first impression. The reasons for a high bounce rate may not necessarily be related to your business strategy or product, but may suggest that the design or the content of the website is poor. In turn, a low bounce rate indicates that visitor expectations have been met. Your goal is to strive for a low bounce rate by optimizing your content, holding A/B tests and choosing options that demonstrate the best results. How to track it: In Google Analytics, you can measure the overall bounce rates for an entire website or single pages, and compare the rates over time. total amount of time a user spends on a website varies, depending on the industry and a product. However, by studying your digital analytics over time and exploring the competitors in your industry, you can discover your perfect total average time per user. As an example, for many software products, a time on site above two minutes is considered to be a bare minimum. Using your average rate, you can judge your website performance and, if needed, work on user-experience improvement. Keep in mind that a high bounce rate will influence and lower your average time on site, as the time for a bounce equals zero. How to track it: Google Analytics can provide you with data on how long the user sessions on your website last. The average total number of pages visited on your site by a single user is also a good indicator of a successful product. Rates of 4-5 pages or more are considered high. This number represents how interested the visitors are in what you have to offer. To raise that metric, work on the quality of your product and content. It’s a good idea to provide some cross-links to motivate users to explore further. How to track it: Use Google Analytics to find out how many pages on your site were visited by particular users or groups of users. Users who have been to your site once and returned later are called “returning visitors.” If you have a big percentage of returning visitors, make sure they don’t only browse, but also complete a purchase. If visitors don’t stay for long and never return, consider revising your website and hold tests. However, take into account that the percentage of returning visitors may vary from industry to industry, so do your research first. How to track it: Go to the Google Analytics dashboard to find out how many visitors return to your website. However, note that “new” visitors are the people who visit your website for the first time from a new device. Every time a user opens your website on a new device, they’re considered to be a new visitor. The number of returns, though, is counted during a 2-year period. Customer lifetime value (LTV) is one of the most important metrics for product/market fit. LTV shows how much you profit from an average customer during the entire product lifecycle. Do your best to have longer lifecycles, repeat customers and higher LTVs as a result. Here, not only your website comes into play, but also the quality of your customer service and other aspects of your business that directly influence your users. Calculate the average purchase value. Calculate the average purchase frequency rate. Avg. customer value = Avg. purchase value − Avg. purchase frequency rate. Calculate the average duration of customer relationships (lifespan). LTV = Avg. customer value * Avg. customer lifespan. To measure how much your audience likes your product, ask them if they would be willing to recommend it to others. That’s a basic technique to learn how successful your product is and how loyal your customers actually are. To motivate consumers to refer your product to others and raise your NPS, add some benefits to it. Offer additional services, longer free trials, discounts and other things that can influence customer decisions. How to track it: Create a survey and share it with your existing users. You can invite people to take this survey after every purchase they make to increase the number of answers and the accuracy of the survey results. Engagement represents the level of interest that users demonstrate in a product. However, only constant engagement brings in loyal customers and sales, so your goal is to not just attract new users, but to make them stay. How to track it: Google Analytics is also very helpful here. You can track how many people have started interacting with your content (for instance, through reading your website), how many of them finished that interaction, and how long it took them to get from the beginning to the end of the content. How many paid users do you have? Calculate that number, and compare it to the overall number of users to see if the audience is ready to pay for your solution. If it isn’t, think more to find out why. To get more insights, do surveys and simply get out there and communicate with your audience directly. You’ll be surprised at how willing and helpful can users be when they feel their opinions actually matter. How to track it: This one is simple. As you just need to subtract the number of paying users from the overall number of users. To go even deeper, try to track at which moment in the customer journey when people actually make a purchase. That can help you understand where the problem is hidden. How great is your organic traffic? Tracking this metric shows how many people actually come from backlinks, search engine results, referrals, and other free sources. How to track it: Go to Google Analytics to track how many people come to your website through organic means and where they come from. It’s vital for you to understand what sources you should put more effort into to get even higher organic traffic. It’s always better to avoid mistakes than to fix them. That approach will always help you save resources, money, and precious time (which is basically the same as money these days). There’s a difference between product/market fit and problem/solution fit. You should measure how much your audience needs your product, not just how much it needs the solution. Product/market fit is not an action, but rather a process, and a sudden skyrocketing here is an exception. Get ready for many iterations of tests, adjustments, and updates. Product/market fit can’t be tracked with binary measures. Instead, you should be measuring the percentage of how the product fits the needs of a consumer. Do your best to improve the key metrics we’ve discussed above. The market, the product, and the audience keep changing over time. That’s why a product/market fit is not a stable status, but an ongoing process. Always keep that in mind. Every market, as well as every target audience or segment, may require a different product/market fit. Do ld research to find out the needs and the problems your audience is facing and see if it’s necessary to develop additional solutions. Remember about your competitors and always keep your finger on the pulse of your industry. Other companies may create a product that offers better features than yours, and your goal is to be the first to know it and take the necessary measures to take your product to a higher level. Testing is the key to success. You should always be hungry for feedback from your target audience to see what they like and don’t like. Conduct A/B tests and compare the results to find out what appeals to your audience. Do your best to keep improving the product and always stay ahead of your competitors. 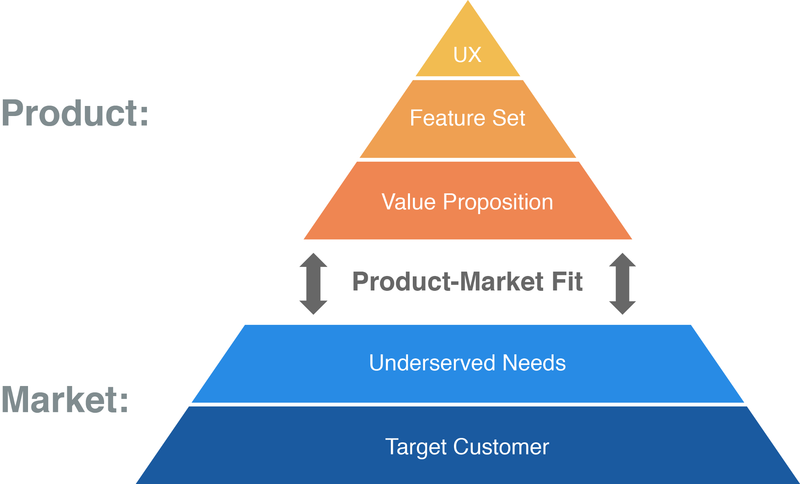 Product/market fit is not just about product marketers, marketers in general, or developers. It’s about the whole company, and every team member should participate in its development.